Home Digital Marketing Affiliate Marketing How to Make Money On Instagram? 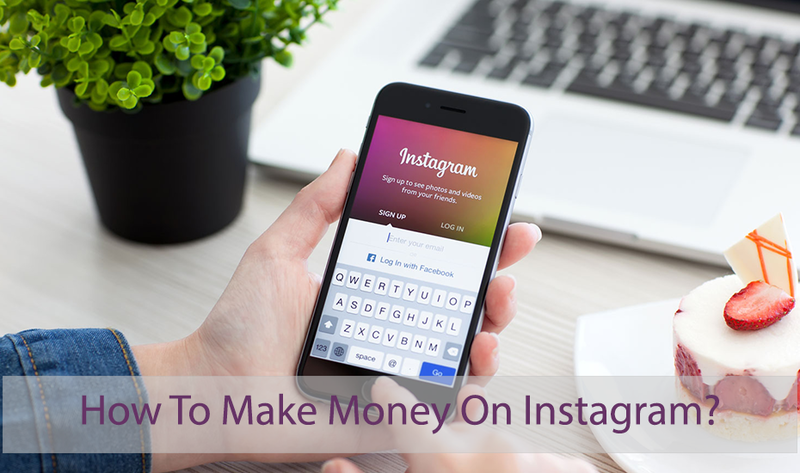 Instagram is a source of money making online. It is a force of nature. What was entirely a photo-sharing app initially has become one of the best social media platforms in very short span of time. Just look at these stats how it ranks among the world’s most famous social networking sites as of January 2017. With 700 Millions active users on Instagram, its rank is much higher than any other social media platforms including Tumblr, SnapChat, Pinterest, and LinkedIn. Let’s see how well peoples respond to simple, visual driven content. 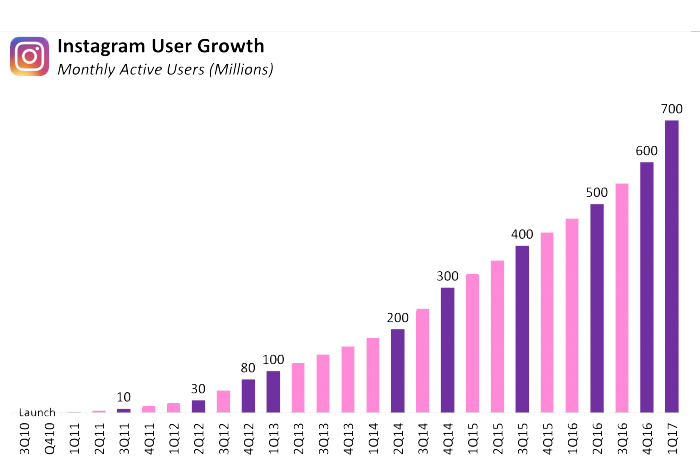 And just look at this maximised interest in Instagram over the past six decades. And I am pretty sure about that it will be down at any time. No matter how you crack it, people love Instagram for sharing photos and stories. It is one of the most popular photo sharing app as it’s owned by Facebook that is already a giant in social networking. In numerous cases, I even choose Instagram over Google images, Pinterest, or WeHeartIt. It’s just easy to use and the vast majority of the images are super high quality and filtered images are just an amazing. I am working in online marketing agency since 2012, but as with any social media platform, a online marketer’s first intuition is to find a ways to make money from it. You may be asking yourself,” How can I increase the inbuilt user base to generate legitimate income? ” as I do. In this blog, I would like to discuss a few techniques and ways to leverage passive income using traffic base. Some of the bloggers are on the smaller scale they earn less than $200 per month. And others are on the large scale earning $10,000 plus a month. Your potential of earning is truly based on your focus and how much time you’re willing to put in. Most of the marketer running blogs and using affiliate to increase their revenue. It doesn’t mean they cannot explore more. So, here is another platform ready to make money that is ‘Instagram’. How do you go from zero to cash with a few tricks? Creative accounts on Instagram is gaining attention more than simple names as peoples are crazy to follow those creative accounts instead of using sober peoples. For example I have an Instagram account for selling artworks, paintings, and home decor ideas sharing. This account is operated by two of my classmates and we have gained such an great start-up in just two months which is not huge but at least we can own a clothing for our two classmate team. Creative accounts are receiving referrals from their down the line followers. So, that’s how you can sell more with creative accounts. You’ll earn $5 for each of your photos you sell. Here’s is another thing about Foap. Making money online is not easy, so you definitely need to have a strong “Photography Chops” to make money. You can’t slap up some completely clumsy content and anticipate to making a kill. It’s not going to happen and quality of photographs is essential. So, I recommend that first develop your photography skills before attempting to sell anything onFoap. If you are enough experienced in professional photography then money is waiting for you.Being successful is really just boils down to how skilled professional you are at photography. Once you have taken a picture and shared, it has the potential to keep bringing in cash. And while you’re probably not going to get rich earlier, there have been numerous Foap users who have already made thousands of dollars yearly. Let me clarify this term this is not a viable technique unless you have a significant following.If you have got only 300 or 500 followers, then this is not for you.However, if you’ve got at least 5,000 followers, this is definitely a strategy going to work for you. Here’s how it works. Create a sponsored Instagram post. (You can use Photo or Video)You can mention peoples, fancy hashtags, and link to promote a brand. Share your sponsored post with audience. You will get paid for it. It is quite interesting way to increase revenue from Instagram but it does work only when you have sizable and engaged audience on Instagram. Let me give you an example of money making idea using sponsored posts. 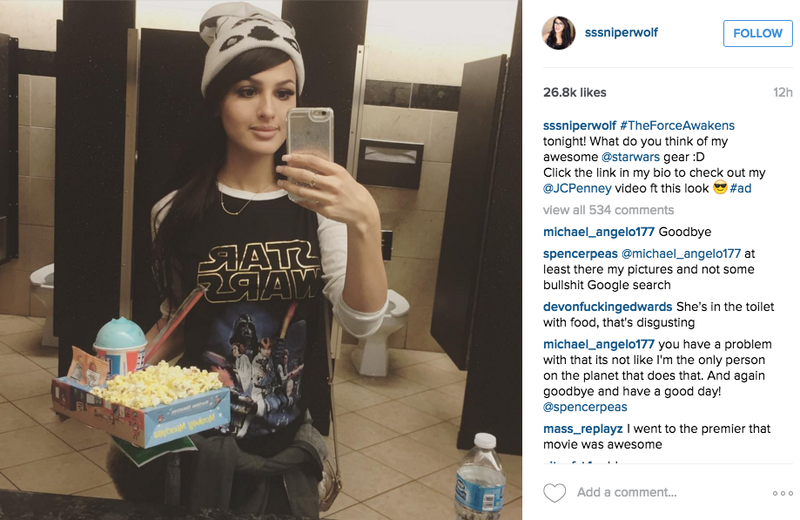 A couple of year’s back Hollywood movie, Star Wars: The Force Awakens was released. To create buzz, HP and Lucas film used this concept to create integral promotional strategy. So, you don’t need millions of follower to capitalise the amount of your earning but at least 5,000 followers are required to make sponsored post on Instagram. Ifluenz is one of best way to connect brand with influencers. 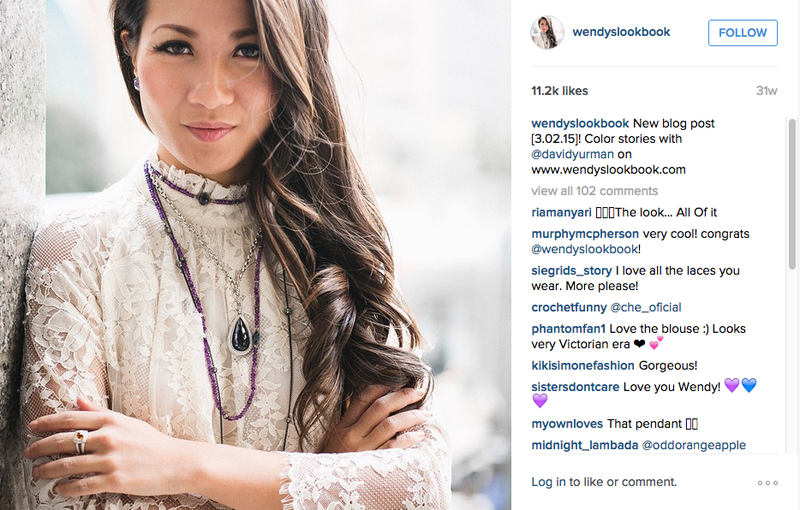 What happens is when brands setup campaigns to promote their product and services and pre-selected influencers Instagram accounts. If you have pre-selected influencer’s accounts to promote your brand products and services, then you have to two days to post a picture of brand in a positive way.Once it is validated, then you will get paid. Here is the sponsored post example of successful campaigns that were run on Ifluenz. Monetise your social influence.To get started, click on “I am an Influencer or I am a brand” from ifluenz. Enter your instagram username to validate your eligibility. As mentioned before, you must have at least 5000 followers on instagram to be eligible and get paid via valid Paypal email address. If you are verified then you will get setup and start searching for brands you would like to promote. As per advertising laws you must have to choose brand that you really trust or believe genuinely. In other words, do not promote craps just for a quick payday because it is strictly prohibited. This is important to boost your long term equity and credibility. Here’s how you can take advantage of this technique.First, you need to select affiliate products to promote. If you are new to affiliate you can search on Google for “Highest Paying Affiliates”.You will get a list of affiliate networks to join. Some popular affiliate networks where you can get products to promote. Or you can also check individual brands that offering affiliate programs. Shopify is one of the highest paying affiliate network that shares 200% of their individual sale from affiliate. So, there are various affiliate network that offer affiliate products but end of the day you should have solid conversion rate. After all, I truly believe that Instagram is boasted with money making opportunities. Becoming successful simply demands that you use the right resources in coexistence of one another. However, its selling your photos, paying to Influencer, selling from your own store, and selling your photos, there are lot of options available according to the base of your Instagram followers. With the massive audience that’s the only way that going to get better, Instagram should continue to be great source of money making online for years to come. Brand SERPs – Why You Really Should Be Tracking, Evaluating and Improving?